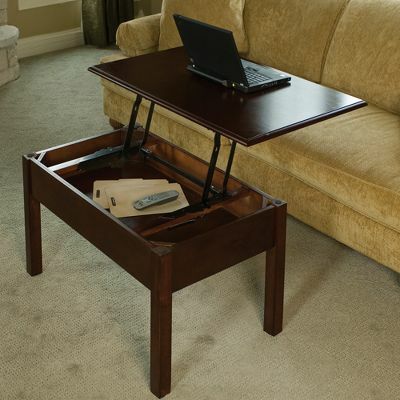 Convertible Coffee Table Turns Into A Desk | OhGizmo! I spend a lot of time in my office working, but the jobs I do allow me to work from home. Thus, there are times where I’ll work outside on my porch, or even on the couch. While I don’t mind working on the couch from time to time, I don’t always like my laptop sitting on my lap. I’ve tried those little portable laptop desks, but they’re no better. What I need is one of these Convertible Coffee Tables. The table looks much like any other, but it packs a special feature. You can lift up on the top, and move it towards you. In fact, it can be raised 31 inches, and moved forward up to 15 inches. This brings the surface to a more reasonable height for working on a laptop. Also, if you live in a small apartment and don’t have room for a kitchen table, this could be a great substitute. The $200 price is steep, but I can’t say that I’m not tempted. I've had a convertible coffee table for years. Don't know where I would be without it.